Your home is somewhere you and your family need to feel safe and secure. While not at home you need to know your property and assets are as secure as possible. Rekeying - In many cases we can save you the cost of installing new locks by rekeying existing locks. 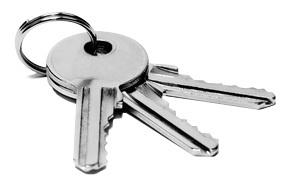 This is a simple, inexpensive process whereby we replace only the barrel of the lock and supply you with new keys. Keying Alike - Any or all of the locks in your home can be keyed alike and locked/unlocked using just one key. No need to carry a bunch of keys when one key can give you access to all locks. We are up to date with all tenancy laws and look after rental properties for numerous landlords and real estate agencies who need to know that they meet all legal requirements. If you are not familiar with the current tenancy laws then we are happy to inspect any or all of your properties for you and can provide a written report as to the work required. We believe our service offers the best value for money in Perth so why not give us a call. We also offer a genuine 24 hour emergency service.